Don't buy a new ultraportable laptop or MacBook Air until you read this story (seriously). 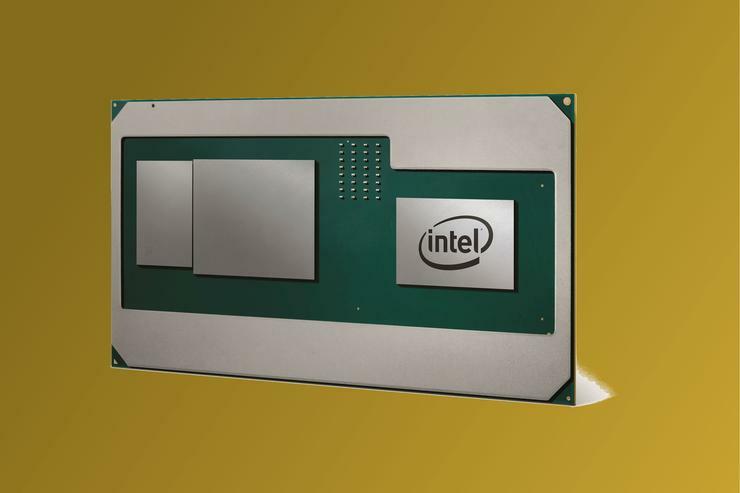 Intel's 8th-generation Core CPUs solve a problem for the superlight (sub-three-pound) laptops that are becoming increasingly popular. Up to now, these laptops could handle only dual-core CPUs, because quad-core CPUs created more heat than their slimmer profiles could manage. That's all changing with Intel's ground breaking 8th-gen mobile CPU. Quad-cores once confined only to much larger and heavier laptops can now be stuffed into a tiny laptop, or so the company claims. But can the 8th-gen CPUs actually give you the performance you expect and you're paying for? Or this is this just a cynical attempt to sell you on some quasi-"quad-core" for you next laptop? To find out, read on. Intel's 8th-gen Core i7 promises to bring quad-core performance to ultra-portable laptops. Unlike desktop CPUs, laptop CPU performance has always been a tricky task, as isolating the CPU is nigh impossible. Different laptop manufacturers will set the CPU to run at different speeds based on how much cooling they stuff into it, or how loud they want the fans to run at. Basically, trying to compare an 8th-gen Dell XPS 13 to a 7th-gen Acer or HP introduces so many variables out of your control that it can be difficult to render a final decision. There is one way to get you closer, though: Compare the same laptop models made by the same manufacturer. That's exactly what we did this time, using Dell's newest XPS 13 with a Core i7-8550U inside. To this, we compared a Dell XPS 13 with a 7th gen Core i7-7500U. For context we also lumped in the original Broadwell-based XPS 13 from 2015. Although outfitted with "only" a Core i5, we included it because it was also the model that first ushered in the zero-bezel "Infinity bezel" design. The laptops we're comparing feature these CPUs in them. And because we all want to know how the 8th gen hangs with "real" quad-core CPUs, we also include two Dell XPS 15 models with much more powerful quad-core CPUs and GPUs inside. That's right, we're pitting smaller, lighter laptops with lower-power 15-watt TDP CPUs against large laptops with 45-watt TDP CPUs, but they're all quad-core. Let's see what happens. One last important important point we'll make: All of the laptops here were updated with the latest version of Windows 10 available to them, as well the latest drivers and BIOSes. This is actually a very critical step for trying to dive into direct CPU comparisons, because drivers and BIOS versions can have huge impacts on performance. A laptop can launch and six months later, the OEM could decide to increase or decrease the performance based on customer complaints about temperature, fan noise or performance. With that said, only the XPS 13 laptops had Windows 10 Fall Creators Update installed. Microsoft, it appears, did not deem the XPS 15s worthy. 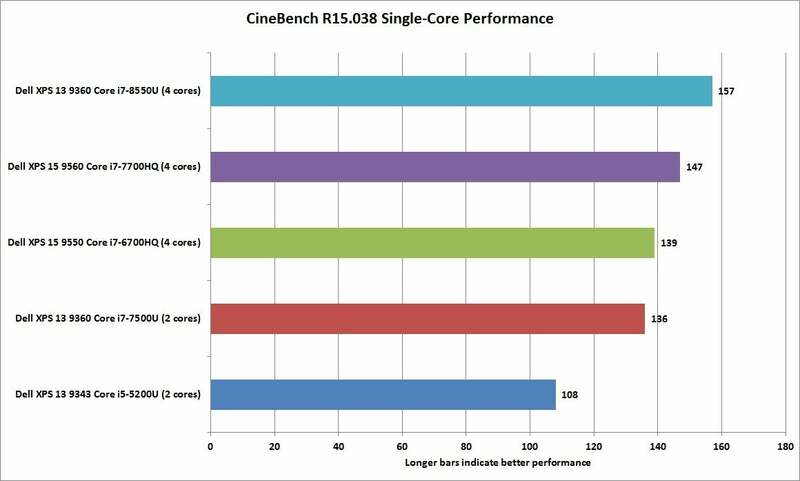 Our first test is Cinebench R15. It's a popular test built by Maxon and is based on the engine that runs its professional Cinema4D 3D rendering engine. The test concentrates on the CPU and is heavily multi-threaded. The results speak for themselves. Anyone who thought Intel couldn't pull off a quad-core in a 2.5-pound laptop has to eat their wordss as the Core i7-8550U simply destroys the 7th-gen Core i7 dual-core CPU, and for the most part hangs surprisingly well with the much hotter 45-watt quad-core chips in the two XPS 15 laptops. What does this mean? It simply means, dayum: Intel's new 8th gen is fast. Dayum: Look at that 8th-gen quad-core CPU hanging so close to its beefier 7th-gen predecessor. Cinebench R15 also allows us to test performance of the application in single-threaded tasks, so we threw the switch and ran all five laptops through the same task. The real surprise is the winner. You'd think it would be the Core i7-7700HQ in the newest XPS 15, but no, it's the new Core i7-8550U in the XPS 13. Okay, what's really going on here? 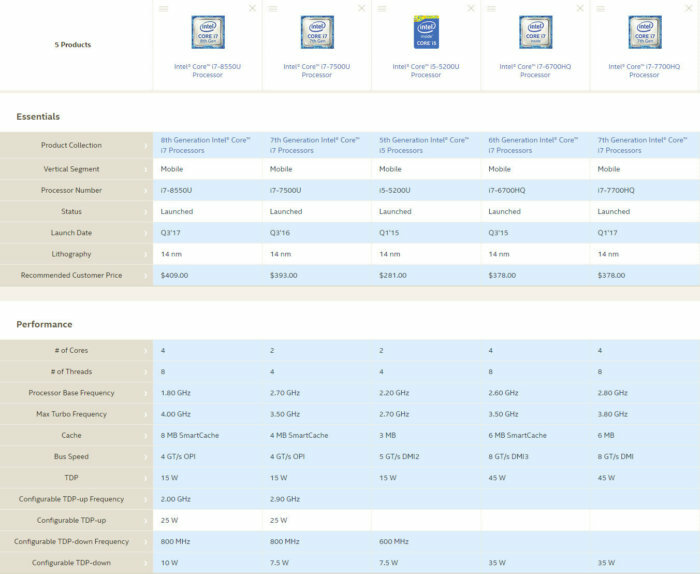 Well, if you look at the detailed specs in the Intel ARK chart (or click this to see them) you can see that the new Core i7-8550U has a higher turbo boost speed of 4GHz, compared to the 3.8GHz boost speed of the Core i7-7700HQ. 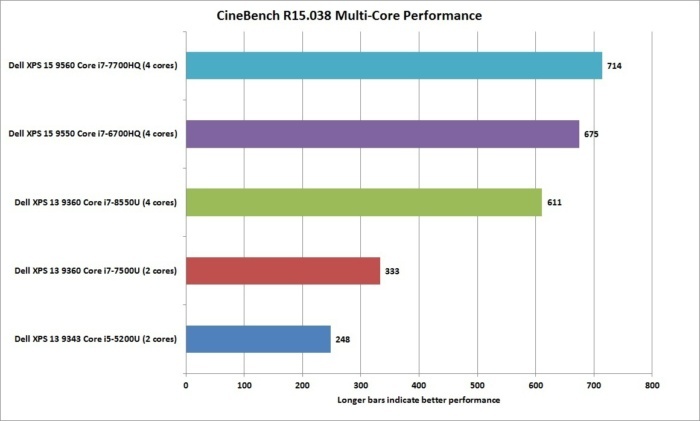 Cinebench R15 clearly shows that boost speed can pay off. Given that the vast majority of applications people use rely far more on single-threaded performance than multi-threaded performance, this result is more important than it might seem. 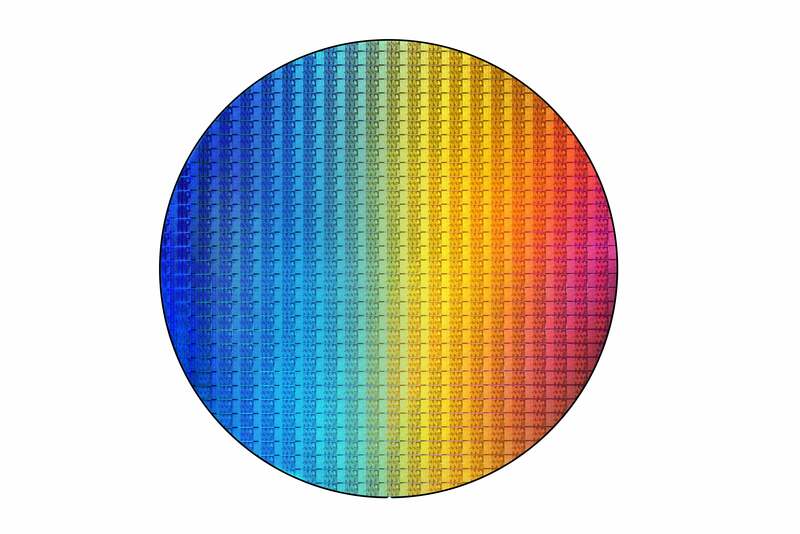 The higher 4GHz boost clock of the new 8th gen Core i7 gives it a leg up over the 7th-gen CPUs. Next we ran POV-Ray, a ray-tracing application that literally dates back to the days of the Commodore Amiga. It's been updated and moved to x86, of course, and it's still a valid performance benchmark. Like Cinebench, it focuses on the CPU. We again see the 8th-gen quad-core Core i7-8550U easily blowing away the older 7th-gen dual-core and hanging with the much hotter 45-watt quad-cores. 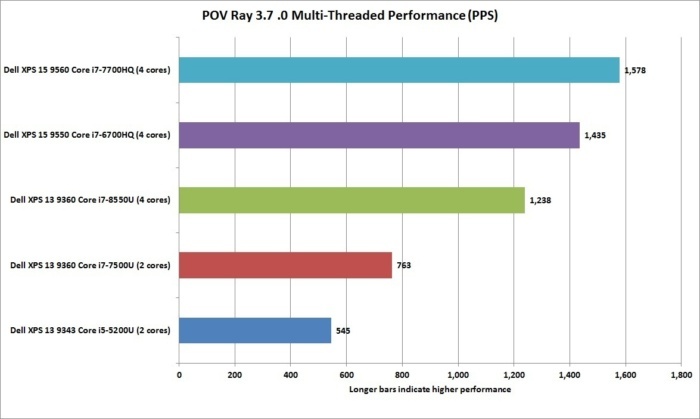 The 8th-gen quad-core Core CPU sticks close to 7th-gen quad-cores in POV-Ray multithreaded tests. Like Cinebench, the POV benchmark can use a single compute thread. The result places the new 8th-gen Core i7-8550U in a good place, just behind the Core i7-7700HQ in the XPS 15. Note how the 6th-gen quad-core Core i7-6700K actually falls in line just behind the dual-core Core i7-7500U. Because both CPUs have the same boost clock of 3.5GHz, we're not surprised. 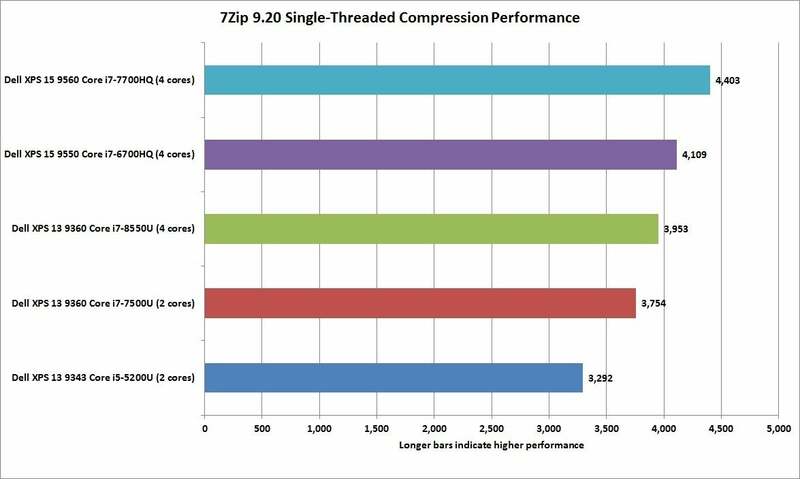 This is, again, a very good showing for the new 8th-gen Core i7-8550U chip. 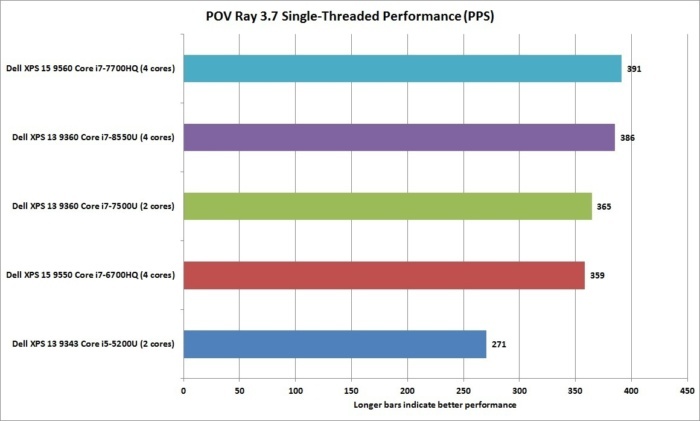 The 8th-gen Core CPU did well in single-threaded POV-Ray as well. 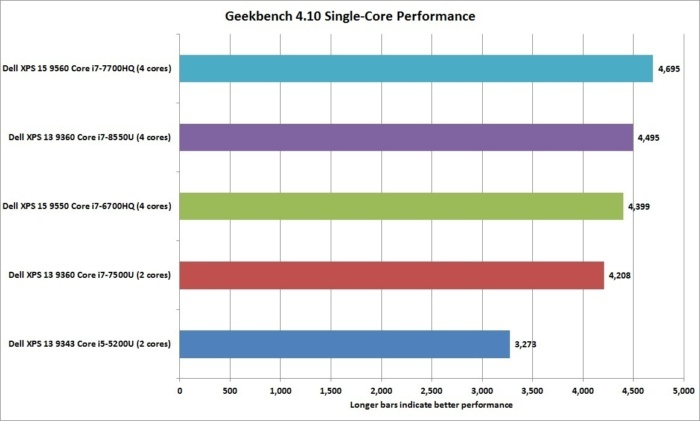 While both POV Ray and Cinebench hone in on CPU performance while rendering or ray tracing, Geekbench 4 tends to be a little more general and relies on a large list of algorithms that its maker, Primate Labs, considers relevant to processor performance. While Geekbench has been controversial at times, it's mostly only when enthusiasts try to point to it as proof that a tablet chip is as fast or faster than a desktop chip. We won't rehash all of that, but we will say the test is far more relevant when it's kept on the same CPU microarchitecture. That is, of course, what we do here, as we stick solely to testing XPS 13 and XPS 15 laptops. The results in Geekbench's multi-core test speak well for the 8th gen Core i7-8550U. It runs dead even with the 6th-gen quad-core Skylake chip. And yes, it simply leaves the dual-core chips in the dust. 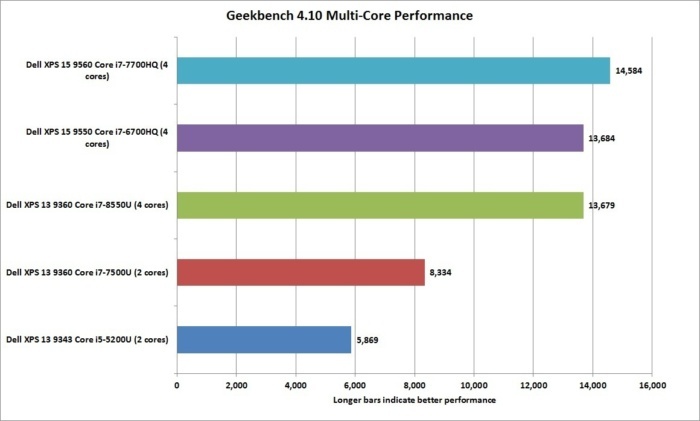 Geekbench 4 uses various modern-day algorithms to try to suss out the performance a CPU. Moving on to Geekbench's single-core performance test, we again see the spunky XPS 13 hanging with the XPS 15. For the most part, the test puts all of the Core i7 CPUs in the same neighborhood. We'd tend to agree with that assessment, too because you'd be hard-pressed to tell the difference between a 7th-gen Core i7 and an 8th-gen Core i7 when using, say, Outlook. The single-core performance actually places all of the Core i7 CPUs in a the same neighborhood. The results from this real-world application pretty much mirrors what we've seen already: a complete dusting of the 7th-gen Core i7 by the 8th-gen Core i7. 7-Zip's internal benchmark confirms what we've already seen: 8th-gen Core i7 smokes 7th-gen Core i7. 7-Zip also allows for a single-threaded or single-core test. The results again mirror single-threaded scores from other benchmarks. 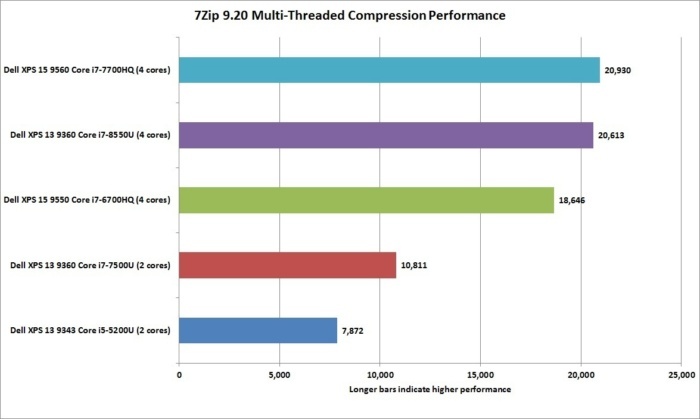 Single-threaded performance of the modern Core i7 and pretty close. 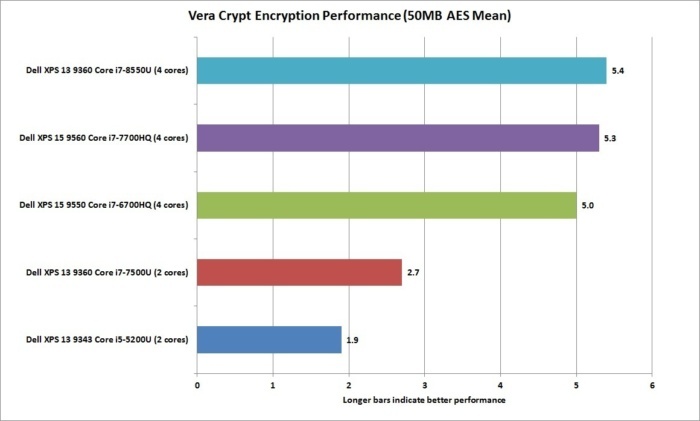 We tried another internal benchmark, this one from the VeraCrypt free encryption program that's a fork of the departed TrueCrypt. For the most part, both of the XPS 15s are dead even. No surprise, the 8th-gen Core i7 is just a step back from those quad-core laptops. And yes, dual-core, call us up when you cross the finish line. In yet another test, the 8th-gen Core keeps up with its 7th-gen predecessors. Although the performance of the 8th-gen Core i7-8550U looks downright spectacular, one thing we wanted to know is whether it could hold its performance on workloads that didn't last 5 seconds or 50 seconds. Laptop CPUs are especially sensitive to thermal limitations, and long workloads generally means less performance. Our Handbrake test is thus perfectly suited to see what kind of performance you can expect on a very long task. On a dual-core, it can take an hour and a half to complete, for example. 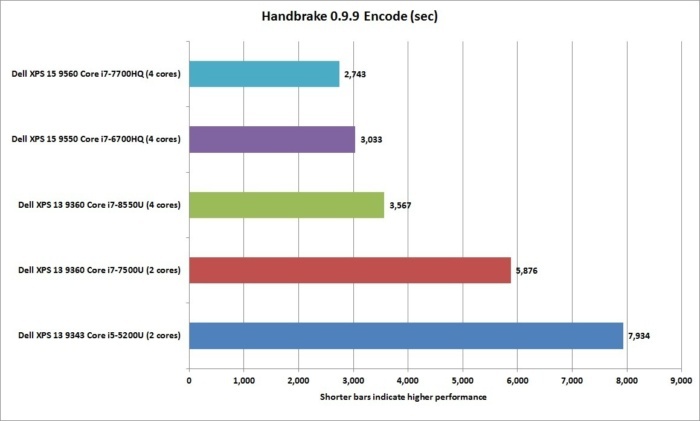 On very challenged laptops, we often see pretty large hits to performance as it heats up. The results here are, frankly, impressive. We say that because the Core i7-8550U has a processor base frequency of 1.8GHz. That's basically the minimum clock speed the CPU would run at under the worst-case scenario, and certainly something we thought it would hit with a long workload. Instead, the 8th-gen Core i7-8550U inside the XPS 13 again surprises us by destroying the 7th-gen dual-core Core i7-7500U. For the most part, it hangs with the quad-core XPS 15 laptops, though having a larger, beefier laptop with a much larger cooling system remains an advantage. Still, for the size of the XPS 13, its performance in Handbrake is very, very respectable. Despite its TDP of 15 watts, the 8th gen CPU in the XPS 13 hangs much closer to the XPS 15 than we expected. But how does it do with games? Find out on the next page.